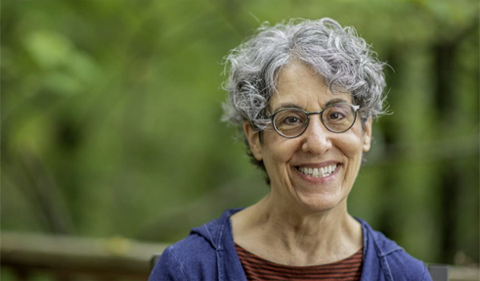 Dr. Jacqueline Wolf, Professor of the History of Medicine in the departments of Social Medicine and History at Ohio University, recently launched a podcast that explores health care in the United States through patients’ stories. Lifespan: Stories of Illness, Accident, and Recovery features a new episode every month. Each episode focuses on a different theme—breastfeeding, chronic illness, and difficult diagnoses are among the initial episodes. The first episode, “An Accident,” aired in September 2018. Subscribe to Lifespan through Apple Podcasts, Stitcher, GooglePlay, or at the NPR Podcast Directory, or through the mobile apps of these sites. Listen to Lifespan on the WOUB listen page. The show is a collaboration between Wolf and WOUB sound engineer and producer Adam Rich. It draws on Wolf’s extensive experience teaching the history of medicine and medical ethics and researching the history of women’s reproductive health and its effect on public health. Her latest book, Cesarean Section: An American History of Risk, Technology, and Consequence (Johns Hopkins University Press 2018), was funded by a three-year grant from the National Institutes of Health. Much of Wolf’s work challenges the idea that medicine is a dispassionate science; her books and articles explore how culture and society have shaped specific medical practices. Lifespan brings that reality to light in a particularly vivid way by highlighting individual stories about encounters with the health-care system. The show demonstrates that each patient experiences identical illnesses and treatments very differently, depending on their basic outlook as well as their economic, social, cultural, and political context. That’s why Lifespan is more than just a series of fascinating stories. “Each story helps teach us how to approach illness, accident, diagnosis, and treatment, how to effectively communicate our concerns and values and needs to health care providers, and even how we can improve our current health-care system. On Lifespan, listeners learn from the difficult experiences of others,” Wolf says. “The Ohio University History Department has been a rich source of informants for the podcast,” she adds. Episodes have showcased Dr. Steve Miner’s story about falling 150 feet off a cliff the summer after he graduated from high school and graduate student Heather Salazar’s cooking accident resulting in a serious burn. An upcoming episode about gastro-intestinal illness will showcase graduate student Matt Johnson’s bout with diverticulitis. A new episode of Lifespan will be released on the second Monday of every month.